Paris Package 4.0 and the bar’s set set high – we knew we had to come with somethin’ super fly. One eco-friendly pencil, one pocket notebook, one poppy calligraphy notebook and a BONUS colored pencil – it’s STMT X FRANCE! RAHstrs always love the Frenchie kits, so we knew we had to bring it. Found the pencils while searchin’ for mayo (no joke), but our BIG score? 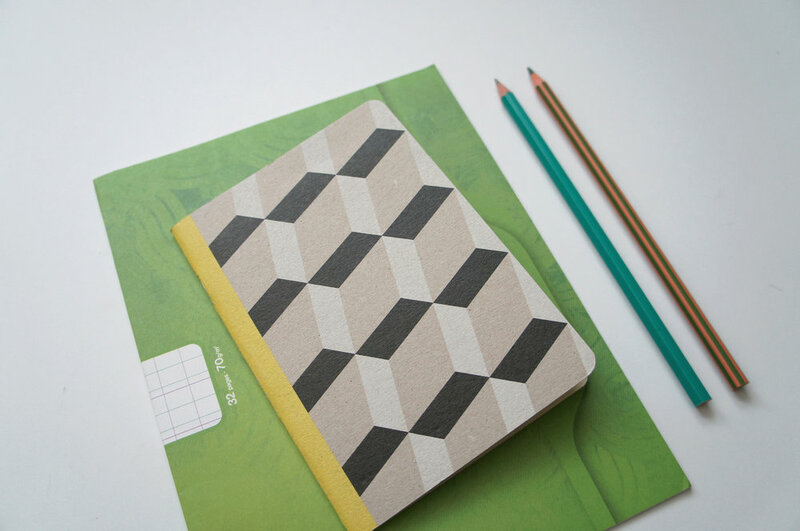 These geometric-dream pocket notebooks from Papier Tigre, a shop in Paris’ oh-so-stylie Marais district. Manager Maxime totally hooked us up – these notebooks are a traveler’s dream! Bite sized and super stylie without being in yo face. A look only the French could create! Go on, shop the France Kit, and read the Low Down to hear about that mayo adventure (and why you should TOTALLY hunt down some French mayo). Jan 10 STMT x France – Take It Off!